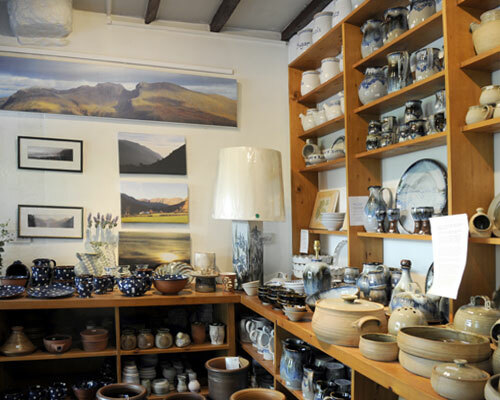 Pottery shop in the Lake District in Gosforth near Wasdale in Cumbria, has lots of pots. Handmade and Handthrown pottery by several pottery artists. At Gosforth Pottery and Pottery Shop we have lots of pots – from Tableware, Kitchen Pots, sets of Crockery and Garden Pots to Ornaments and one-off designs. There are great ideas for gifts, souvenirs or something for your own home or garden. We make our own pottery range and we also have pots from other potters so there is a great range of pots for you to choose from and different types of pottery – Earthenware, Stoneware and Raku. Why not come have a go yourself? Book a pottery lesson and 'Have a go -Throw a Pot!' on the potter's wheel. Or come and ‘Paint a Pot’ – we have a wide range of pottery ceramic shapes, plates and mugs ready to be painted by you – both great ways to enjoy a family activity together or make your own souvenir or special present. We can do pottery commissions, so if you have a special event to celebrate come and talk to us about a personalised plate or mug with a bespoke design and words to mark the special occasion. In the shop we also have a beautiful selection of Lake District Pictures - large canvas photographs of local Lake District scenes, ideal for a feature wall or a stunning gift. Visit us in the Western Lake District, near Wasdale and not far south of Whitehaven, at Gosforth just off the A595, easily accessible from the North or South.